There are 45 Assisted Living Facilities in the Milton area, with 2 in Milton and 43 nearby. The average cost of assisted living in Milton is $2,675 per month. This is lower than the national median of $3,346. To help you with your search, browse the 192 reviews below for assisted living facilities in Milton. On average, consumers rate assisted living in Milton 4.9 out of 5 stars. Better rated regions include Buckley with an average rating of 4.9 out of 5 stars. Caring.com has helped 6 families in Milton find high-quality senior care. To speak with one of our Family Advisors about assisted living options and costs in Milton, call (855) 863-8283. The city of Milton, nestled in both King and Pierce counties, is home to 7,239 residents and has a median age of 39 — yet 26.5 percent of residents are aged 55 and older. Seniors who can no longer live independently will find two local assisted living facilities (ALFs) in Milton and 42 in neighboring cities. Residents in ALFs can expect help with activities of daily living (ADLs) and room and board, as per the Washington State Department of Social and Health Services (DSHS), Aging and Long-Term Support Administration. When compared to the national rank of 100, the cost of living for Milton residents ranks a 122 which is considerably more expensive. Seniors may need to consider that all expenses in the town are pricier in comparison to other cities, including groceries, health care, transportation, and utilities. Seniors in Milton experience mild year-round temperatures between 39 degrees Fahrenheit and 79 degrees Fahrenheit, which enables seniors to participate in outdoor recreation all year. The town also experiences little-to-no humidity throughout the summer. The air quality index in Milton 1 percent better than the national average. However, its pollution index is 249 percent worse than the national average, which may make outdoor activities difficult for seniors with respiratory problems. The Milton area has no facilities from which to choose in the event of a medical emergency or illness, with the nearest major hospital located in Puyallup, Washington. Milton has an array of community resources for seniors, including the Milton Senior Society, an organization that provides community lunch, bingo and other activities for local seniors. Seniors on a limited-income may benefit from living in Washington, where there are no personal income taxes. Alternatively, sales taxes are considerably higher here, averaging around 9.9 percent. Assisted Living costs in Milton start around $2,675 per month on average, while the nationwide average cost of assisted living is $4,000 per month, according to the latest figures from Genworth’s Cost of Care Survey. It’s important to note that assisted living rates in Milton and the surrounding suburbs can vary widely based on factors such as location, the level of care needed, apartment size and the types of amenities offered at each community. Milton seniors may qualify for the Medicaid Community Options Program Entry System (COPES), Community First Choice (CFC), Medicaid Personal Care (MPC) and Supplemental Security Income (SSI) programs. 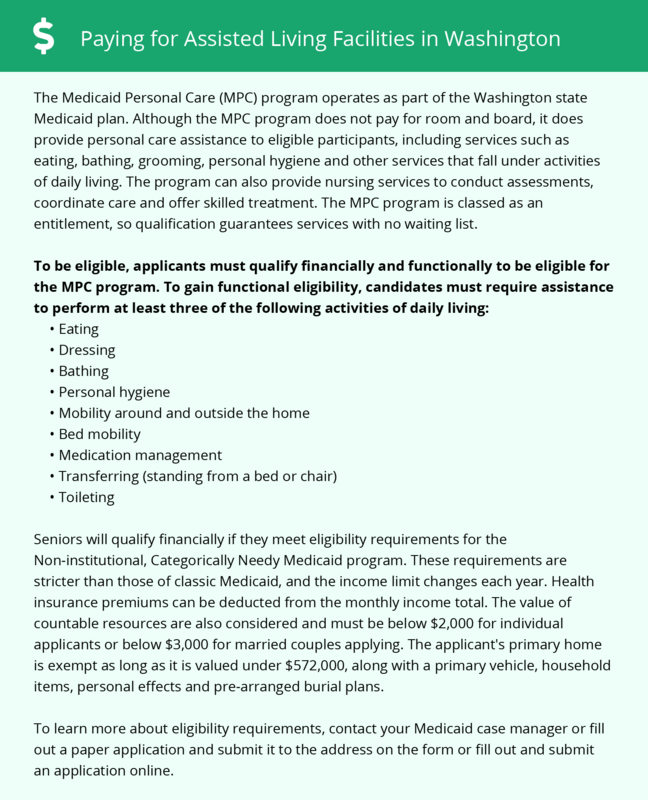 Seniors in King and Pierce Counties also have access to the New Freedom Waiver. Milton and the surrounding area are home to numerous government agencies and non-profit organizations offering help for seniors searching for or currently residing in an assisted living community. These organizations can also provide assistance in a number of other eldercare services such as geriatric care management, elder law advice, estate planning, finding home care and health and wellness programs. To see a list of free assisted living resources in Milton, please visit our Assisted Living in Washington page. Milton-area assisted living communities must adhere to the comprehensive set of state laws and regulations that all assisted living communities in Washington are required to follow. Visit our Assisted Living in Washington page for more information about these laws.